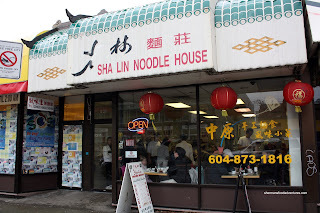 I remember visiting Sha Lin when it first opened its doors in 1996. It was quite a novelty since you could watch your noodles being made. 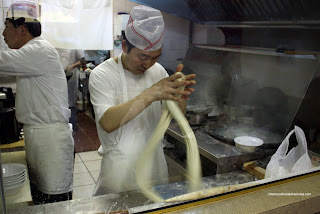 When I say being made, I mean hand-made noodles where the chef is pulling, twisting and stretching the dough. Not many places went through all the trouble back then. In fact, the only other place that I knew of was the Unicorn in Richmond (which is long gone). The neatness factor was elevated with the long spout tea pots where they "squirted" the tea into your cup. So, 14 years later, I have returned to try it again. Why so long? Well, there are so many good noodle houses in the GVRD, it takes awhile to redo places. With Taiwanese beef noodle, Japanese ramen and Vietnamese pho, the noodle landscape gets a bit crowded. Since both of my kids like noodles, we brought the whole family out this time around. As expected, there was the usual lineup during a weekend lunch hour. Good thing that noodles are usually consumed pretty quickly; therefore, tables opened up regularly. Finally seated, we had to decide on a bowl of noodles. Alright, you might think that's an easy thing to do. Well, if you got 2 whole pages of choice, it takes awhile. There is no mistaking what their specialty is here! 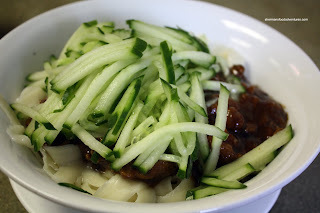 For me, I went for an ol' favourite, Ja Jeun Mein, which is essentially blanched noodles (cutting noodles in this case) with a fried meat sauce on top with julienned cucumbers. As expected, the noodles were al dente with a nice "bite" to them. However, the sauce was extremely disappointing. Not only was it bland, it was very greasy. Moreover, the pork was stringy and tough to chew. If it weren't for the perfect noodles, I would've not liked this dish at all. Something I was not expecting, the Pork Dumplings were pretty darn good. 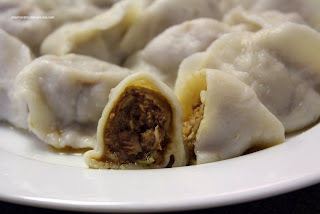 When they arrived, they looked like any other boiled Chinese dumpling; but the filling was super tasty. The meat was moist and well seasoned. Dipped into a bit of vinegar, these rocked. 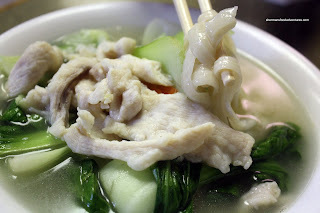 It goes without saying, the dumpling skin was just as good as the noodles. For her order, Viv went for the Pushing Noodles with Chicken and Vegetables. It all sounded quite plain to me and in some sense it was. Yet, for a plain bowl of noodles, the chicken broth was quite flavourful. Enough so that it was enough to give the noodles some taste as well. Mind you, for some others, it could still be too plain (soy sauce anyone?). Of course, the noodles were good, chewy and soft all at the same time. However, much like the meat in my noodles, the chicken pretty tough. Strangely, there was the occasional soft piece mixed in with the chewy ones. Inexplicably, we ordered nearly the same bowl of noodles for the kiddies as well. The only difference was the noodles. Instead of pushing noodles, they got dragging noodles. For those who have no clue what I'm talking about, there are 4 types of noodles here at Sha Lin. Pushing, Pulling, Dragging and Cutting. 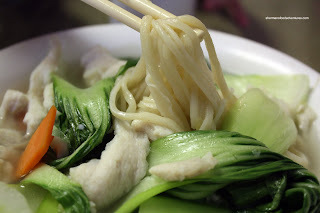 They merely describe the methods used to make the noodles from the same dough. Pushing are thicker noodles, Pulling and Dragging are thinner, while cutting are wider noodles "cut" directly from the dough into boiling water. These noodles are the star of the show (they make it right in front of your eyes) and the star of the menu. The rest of the food is below average. Service is hurried and basic, as with the decor. However, the food is cheap and plentiful. It's worth a visit just to see for yourself. I went there this week for lunch for the first time ever. I went cause I saw Ben and Suannes post about it and ordered the exact same thing as both you guys the Jah Jung Cutting Noodles haha. It was oilier then a teen working at McD's (sorry isn't that one of your jokes) and actually quite salty. Noodles were perfect but I dunno if that's worth it to go back.. I don't understand why this place is so busy. I guess cheap eats. mmm... i'm hungry for noodles now. i used to think they were all the same until a friend took me somewhere where they make them fresh (can't remember where it was). the difference is incredible... i never knew noodles could be so good. You're right Trisha, freshly made noodles have that "bite", chewiness, or in Chinese - "dan sing" which is the elasticity or rebound you get from chewing the noodles. I think Sha Lin is super overrated. Have you tried Peaceful a few doors down? They also do handpulled noodles on site with view of the kitchen. They have a more varied menu and I think they are far superior. Only problem is they can be inconsistent. One day the Dan Dan is almost soupy, next day it's almost a paste like sauce. Szechuan beef noodles is tasty and usually fairly spicy but occasionally mild. It's generally good, just different sometimes. Oh and they just went to cash/debit only. Don't know if I should give up this piece of info... Peaceful has a few precious parking spots in the back.